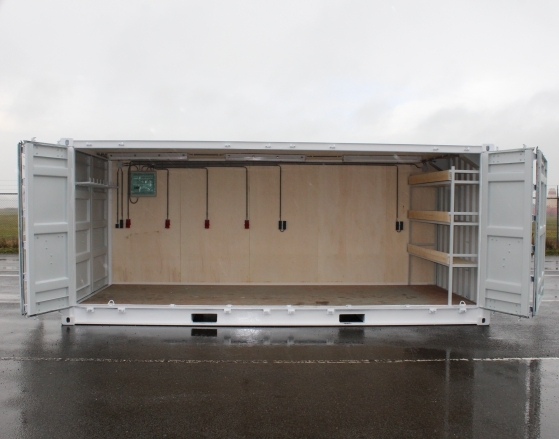 The Following is Release from Damen Shipyards, plugging their containerized workshops. 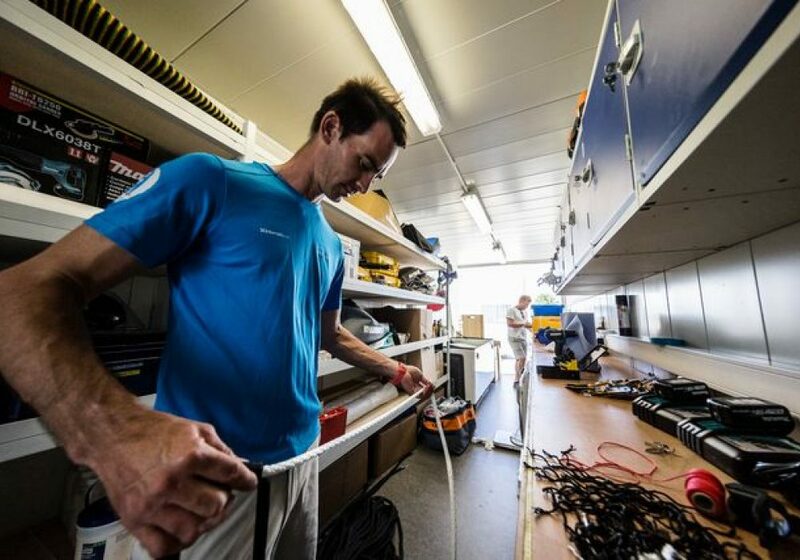 Damen supplied Volvo Ocean Race team AkzoNobel with two workshop containers that were leapfroged to alternate stopovers during the eight-month 11-leg race, thereby ensuring the shore team technicians have their own workshop available at all times. I thought these were pretty cool. I kinda want one. Recently, team AkzoNobel completed its first Volvo Ocean Race, concluding the final leg in second place and finishing fourth overall. The team finished on the podium on six of the eleven legs. 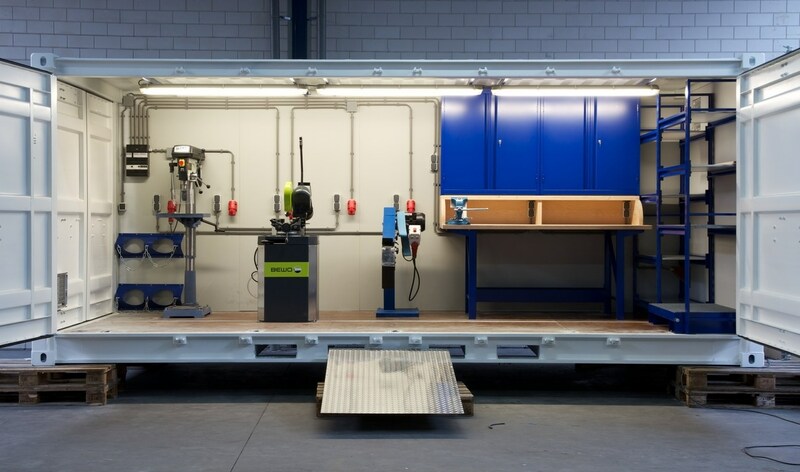 During the race, the team was supported by two Damen Workshop Containers. The two containers leapfrogged each other across the 11-legs and 83,000 km of the round-the-world race, ensuring that team AkzoNobel had onshore support every step of the way. 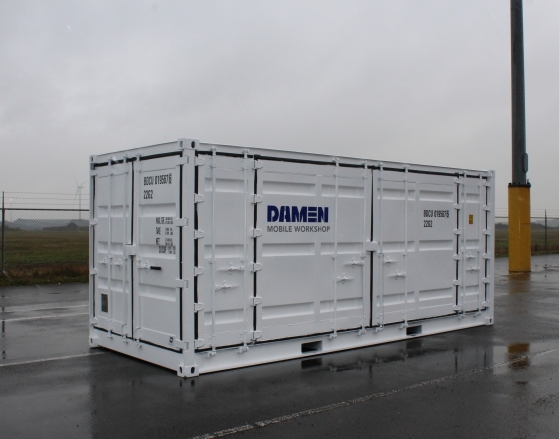 The provision of workshop containers was a natural way for Damen to offer support to the team. The shipyards group has extensive experience in logistics and in the provision of services to ensure optimal vessel performance in terms of both safety and efficiency, from its shipyards and Service Hubs all over the world. According to Simeon Tienpont, team skipper and double America’s Cup winner, the containers enabled the team to compete with those who had prior existence of the race. In fact, in the spirit of collaboration often employed by Damen, the team on occasion shared some of the equipment with their competitors. “We were the best equipped team in the race,” continues Simeon. “In a campaign like this, it’s important that everything must come together – and it did. The partnership with Damen enabled us to compete with teams, some of whom were on their eighth Volvo Ocean Race attempt. And the team certainly did perform; on leg 9 between the USA and the UK they set a new outright 24-hour distance time for the Volvo Ocean Race, covering 602.51 nautical miles. The Volvo Ocean Race is a grueling round-the-world yacht race, held every three years. The 2017-18 edition started in Alicante, Spain in October last year. The course circumnavigates the globe, crossing four oceans and more then 80,000 km before culminating in The Hague, the Netherlands in June. The 2017-18 Volvo Ocean Race marked the debut of the Dutch team. The team’s principal sponsor is a leading global paints and performance coatings company and major producer of speciality chemicals supplying assorted ingredients, protection and colour to industries and consumers worldwide. This entry was posted in sailing on July 24, 2018 by Peter.